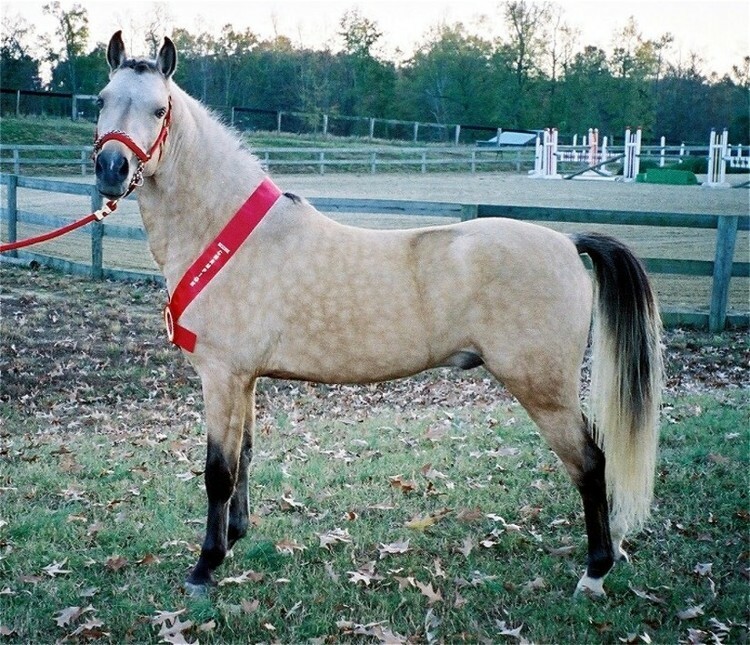 We would like to introduce you to our 2002 golden dappled buckskin Registered section B Welsh Pony stallion. He has now been approved First Premium as an American Sport Pony stallion. He was the site reserve champion, and was awarded the the highest score of the day, an 8, for his jumping on November 14, 2004. We are very proud of Golden, and are looking forward to seeing his offspring in the years to come! We purchased this colt as a yearling from RosMel's Welsh Pony Farm in Texas as a potential sire for our Welsh and Arabian-Welsh breeding program. He is a medium, at 13.1 hh. 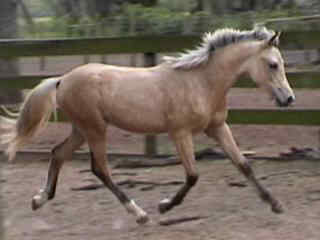 He is a very fancy mover, and is very smart--he is progressing through Parelli training at a very quick rate! 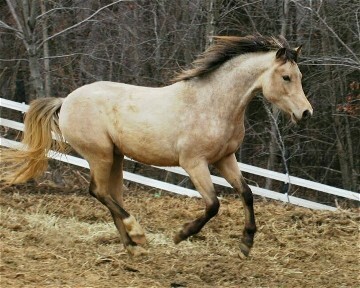 He is also a fabulous golden dappled buckskin color. This boy will turn heads! 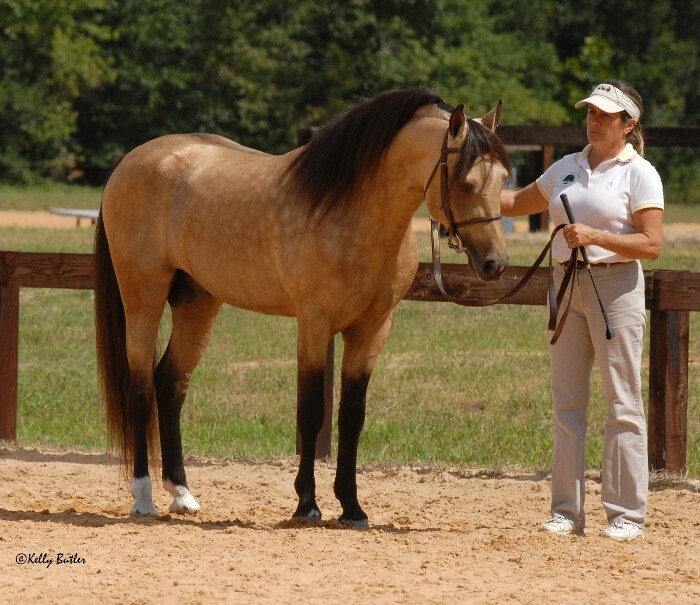 Golden's Sire, Rosmel's Creme de Mint is a First Premium approved American Sport Pony. The American Sport Ponies are the pony equivalent to the warmblood, the horses that are used in competitive arenas world-wide. We are focusing our breeding efforts on producing quality competition ponies for the entire family. These ponies will excel in FEI Olympic sports of Dressage, Jumping and cross-training, and will be well-mannered enough, with bold and correct motion to do Hunters as well. 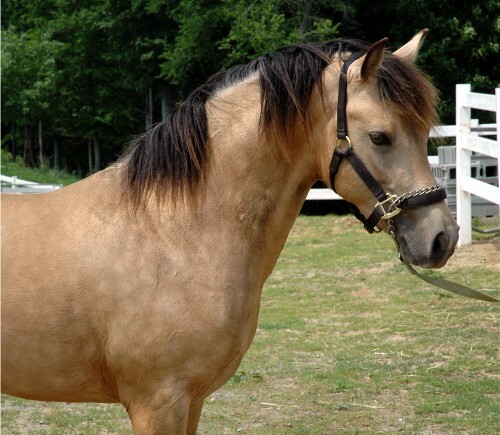 All foals can be registered with the Welsh Pony and Cob Society of America (WPCSA). 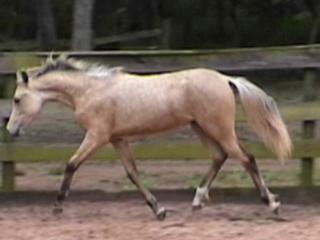 Summer 2007: WB Golden Sunrise (Half-Arabian Half-Welsh weanling filly) sired by Golden won her class at the Carolina Welsh Show. 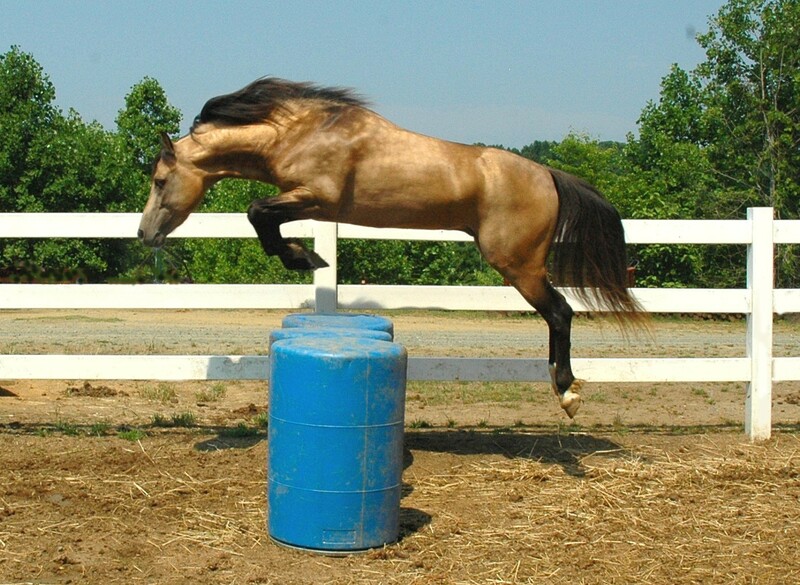 Golden free-jumping summer of 2006. Golden, maturing very nicely during the breeding season in the spring of 2005. 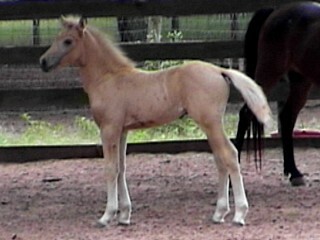 Golden at Rosmel's Pony Farm as yearling. Golden at 6 weeks. Doesn't exactly look like a buckskin, does he?